When a young boy visits a tropical rain forest, he pretends it is a long time ago and that extinct and rare animals live in the forest, and Aboriginal children play there. But how much longer will the rainforest remain, he wonders? 1998 Shortlist for Children’s Book Council Association Awards Honour Book (Picture Book of the Year). Jeannie Baker was born in England where she finished Art College before moving to Australia. She is the author–artist of a number of distinguished picture books including Where the Forest Meets the Sea, a Boston Globe-Horn Honour Book, and the recipient of an IBBY Honor Award. Another of her picture books, Window, was shortlisted for the Kate Greenaway Medal in Great Britain and won the Children’s Book Council of Australia Picture Book of the Year Award. Her characteristic use of mixed media to create detailed and elaborate collages is stunning and unique. 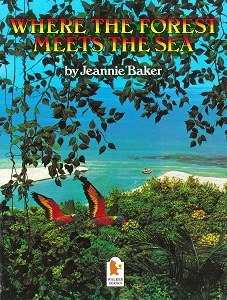 Where the Forest Meets the Sea and The Story of Rosy Dock have also been made into animated films, both directed by Jeannie. Mirror was the winner of the Children’s category at the 2011 Indie Book Awards and shortlisted for NSW Premier’s Literary Award. Mirror was joint winner for the 2011 CBCA Book of the Year Awards – Picture Book of the Year.